Jaap Se Bay at Brenton on Sea is a ‘secret’ cove – around the corner from Castle Rock but tricky to find and a long climb down. But a climb well worth doing as Frances and Peter Smith found when they were introduced to it by Dave and Hannah Edge (Brenton Blue butterfly). At low tide there are rocks after rocks covered in huge brown mussels (Perna perna) and others closely packed with redbait (Pyura stolonifera ) – amazing sights. Sheltering in with the redbait were brightly coloured sponges and sea squirts. Around the bases of the rocks were large sandy anemones that close up into sand covered doughnuts and multi-coloured sea anemones including the striking purple knobbly anemone (Bunodosoma reynaudi). Figure 1: Bunodactis reynaudi commonly known as the sandy anemone. Figure 2: Pyura stolonifera commonly known as Red bait. Figure 3: Red bait cut open for bait. Figure 4: Bunodosoma capense most commonly known as Knobbly anemone. Figure 5: Anthothoe stimpsonii also known as Green striped anemone. Figure 6: Cape reef worm. Further on are extensive rock pools full of luxuriant growths of seaweeds, more than they have seen on this coast. 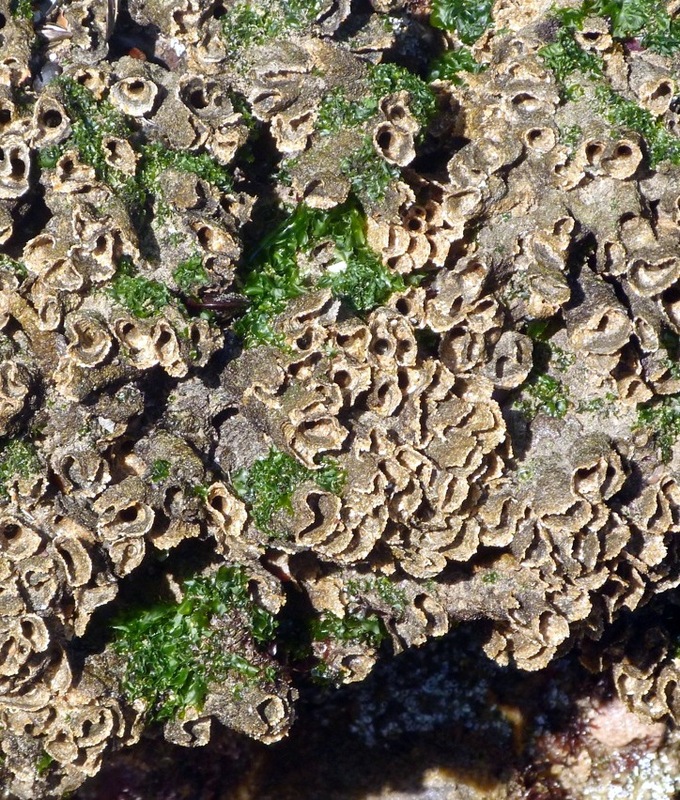 The pools are home to carpets of small bright green sea anemones (Anthothoe stimpsonii) and extensive reefs of the sand-sculptured tubes of the Cape reef worm (Gunnarea gaimardi). Guest post written by Frances and Peter Smith, who run our ShoreSearch project.